AMC's hit Breaking Bad spinoff Better Call Saul passed the halfway mark of Season 1 with this week's episode "Alpine Shepherd Boy", and there have already been a few Breaking Bad characters who have popped up. Of course, Jonathan Banks plays Mike Ehrmantraut in the series, which is set six years before the events of Breaking Bad, and the pilot episode gave fans the surprise return of Tuco (Raymond Cruz). Unfortunately, Peter Gould, who co-created the show with Vince Gilligan, said in January that Breaking Bad stars Bryan Cranston and Aaron Paul will not reprise their roles as Walt and Jesse in Season 1. 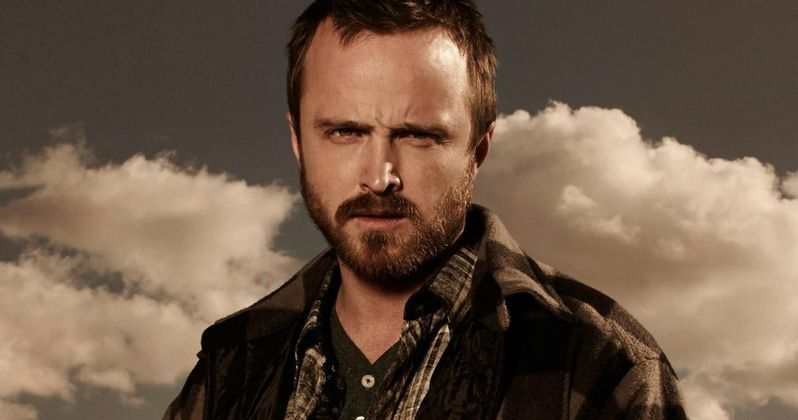 However, Aaron Paul revealed to Variety that he has been talking about returning as Jesse for the spinoff, but they aren't sure how or when it will happen yet. "We always have fun having that discussion - Vince [Gilligan], myself, Peter [Gould], the writers. We just have no idea how that would happen. But hopefully one day." Michelle MacLaren, who directed several Breaking Bad episodes and the second episode of Better Call Saul, also hints that it could be possible for Aaron Paul to reprise his role as Jesse Pinkman, but she doesn't know what the series creators have planned thus far. "Who knows what they're gonna do, but it is a prequel, so [Paul] absolutely could. I think it's open to whoever Vince and Peter decide to bring in. I would imagine that everybody who would ask would say yes, but I have no idea what they're going to do with it." When asked if he has been watching Better Call Saul, Aaron Paul had this to say. "Yes, it's amazing. We've only seen the first two episodes, but I love it. It's a little weird, because it kind of looks like Breaking Bad, it has somewhat of a different tone. I know everyone involved, but I'm not involved in it at all. It's a little weird, a little sad, but it's great." Michelle MacLaren also discussed directing the second episode, praising Bob Odenkirk for his work as Saul Goodman/Jimmy McGill. "I directed the second episode, so it was great. It was one of the most wonderful experiences I've had. I've never laughed so hard behind a camera in my life. Bob is killing it. He is doing the most fantastic job, and I'm so impressed and so proud of him. He's really talented." Do you think they should find a way to bring both Aaron Paul and Bryan Cranston for Better Call Saul? The series has already been renewed for a second season, so it's certainly possible that they could come back next year, at some point. Better Call Saul's first season run continues Monday, March 9 at 9 PM ET on AMC with the new episode "Five-0".